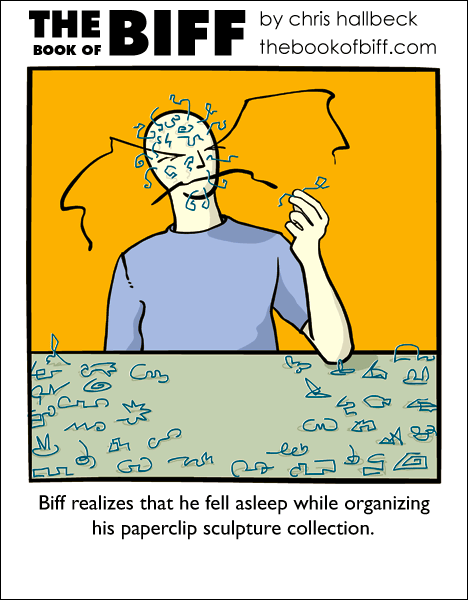 So along with collecting weird science experiments and debt on his gravity bill biff also collects paperclip scultures……who would seen that comming. Hah, that’s great. Those are some creative paperclip sculptures. Aw. There should be some ‘clips hanging off Biffs facial features..
i was bored yesterday so i made a weird paper clip sculpture,it looked like a part of a new cruise ship. Don’t grow up too quickly! Next thing you know you’ll be acquiring kids! How does Biff take all the pain he endures? i collect foreign coins. it’s not worth the fee the bank charges to change ’em back in most cases. though i do have some old coins that my grandpa found in the seat cushions when he was working for Panam. and a Panam coinpurse that is used as a Barbie suitcase. Wow, that actually seems like a good thing to do, all those times while your sitting around in class and the teacher has that nice big box of paperclips. The only thing I’m wondering is how he got them to stand up. Lucky none of them got in his eyes. Otherwise he would wake up with extra strong but painful to apply fake eyelashes. Biff has some amazing talents. I’m refering the paper clip sculpting. Everytime I try, they just snap. When I was kid I collected computer chips. I salvaged computers that were heading for the trash and removed as much removable chips I could and then pin them on styrofoam boards, grouped by categories and serial numbers. That looks painful. I like it! I do that all the time! Every time i try to bend paperclips, they always get stuck in some weird position, so if i drop them they snap back and jump at me. I think you’ve hit the nail right on the head – perhaps Biff uses paper-clips to pre-plan his styling-plans for his eyebrows! ‘Fess-up here, Chris – that’s how Biff keeps those unruly brows under such tight control, right? I collect interesting toys and small Asian art (like kokeshi dolls and old sake bottles from Japan). Of course, if I ever do see my Garfield plushie spring to life, I tell you. He has way too much time on his hands. I’ve always had a weird fixation with small trinket boxes. The sort that’s decorated with beads and glitter and you get from craft shops. They’re incredibly tacky looking but I love them anyway. I’ve made a couple of these that look like birds! So THATS where my collection went! I guess, after stealing the Rembrant and other paintings, and selling half of em, he came to my house and stole my paperclip collection. I always wondered why things always disappeared from my house and the alarm went off every morning at 3:00AM. I used to like bending paperclips like that. Then I stepped on one, and it went like a quarter inch into my foot. No bleeding though!